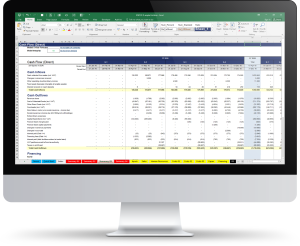 Below is a brief overview of key Excel-Financial-Model features. Be sure to take a look at various screenshots and more details here. Perfectly suited for all kinds of digital/online business models, such as subscription models, Software as a Service (SaaS), Mobile Applications (Apps), Membership Website Models etc. Specific input options (assumptions) reflect revenue models and unique cost structures faced by digital software or online business models. Monthly forecasts and calculations for up to 4 different offerings (= products/services), which can be planned independent of each other. For each offering users can enter key software business focused assumptions including: Subscribers/users, churn rate, customer retention (renewal), upsells, sales model (recurring vs. one-time), payment processing fees, affiliate commissions, revenue share, set-up fees, customer acquisition cost, cost of sales and many more. Select between different contract lengths (monthly, quarterly, semi-annual, annual). Set different billing frequencies (monthly, quarterly etc.) and types (in advance or in arrears). Automatic calculation of important KPIs like e.g. monthly recurring revenue (MRR), total contract value (TCV), customer acquisition cost (CAC), customer lifetime value (CLTV), and many more. Compatible with Excel for Mac and PC. Minimum requirements: Excel 2007 (v12.0) and higher on Windows and Excel for Mac 2011 (v14.0) and later. 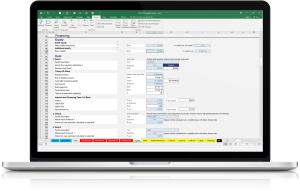 Use the full functionality and flexibility delivered by Excel. Clear and transparent model structure (16 separate sheets, each focusing on a specific planning category, colour coded => input, calculation and output sheets). Compliant with FAST financial modelling standard. Create and save as many Excel files as you like (e.g. different versions or companies). Multiple safeguards to protect formulae and data to prevent input errors or accidental changes (worksheet protection can be removed). Checksum structure delivers error-free financial modelling (more than 30 different control cells). Value-added or sales tax functionality included (optional). Accurate revenue calculation: Depending on your inputs, bookings, revenue and related cash flow will be automatically calculated for each period, including e.g. deferred revenue, a special balance sheet liability account. This assures compatibility with financial accounting policies (e.g. GAAP and IFRS). Detailed capital expenditure (= capex) planning and automatic calculation of depreciation (straight-line or double-declining balance). Automatic calculation of income taxes (incl. prepayments, loss carryforward etc.). Automatic calculation of accounts receivable and payable based on assumed payment terms for debtors and creditors. Overdraft facility (= working capital facility), with individual limit and automatic repayment if liquidity is available. Automatic loan calculation (incl. fees, interest and principal payments). Automatic calculation of capital requirements and funding based on an implied cash flow waterfall (different equity and debt tranches with alternative funding priorities). Forecast horizon: Generate fully-integrated projections for up to 5 years (on monthly basis). Automatic aggregation as quarterly and annual summaries on output sheets. Individually define model start date and choose fiscal year end month (can differ from calendar year). Define any currency code or symbol and preferred denomination (e.g. 000s). Change between UK/International or US/Canadian accounting formats and terminologies by just one click.